Yesterday, I finally managed to meet my dear friend, award-winning cookbook writer, chef, and TV personality Amy Riolo. We’ve known each other online for years but have never managed to actually be in the same place at the same time. We almost met a couple of years back in Verona, but it wasn’t to be. But this time, the Roman gods smiled upon us and we found ourselves sharing a highly enjoyable day in the eternal city. We had just been to Campo dei Fiori, when we turned the corner and spotted a store-front right out of Roman Holiday. A traditional Roman door, with an elegant wrought-iron transom; a plant trailing teasingly over the top; a pea-green bench demanding to be sat upon; and the word Supplizio in complementary colours, its art deco letters jostling for space on the glass. Our eyes met sideways and the answer was clear. In we went. Situated in a traditional Roman shop, with brick walls and beamed ceiling, Supplizio doesn’t feel like a restaurant but more like a living room. Award-winning Roman chef Arcangelo Dandini, the creator and owner, who we were lucky enough to meet and honoured to interview, said that he had wanted to created a bottega of supplì, an artisan’s workshop where supplì are hand-crafted with skill and experience. There are no supplì on display in the shop as they are all cooked to order, but as Dandini said, the place is pervaded with the atmosphere and promise of supplì. He’s not wrong. We went for four varieties of supplì: traditional and then reflecting the classics of Roman cooking, amatriciana, cacio e pepe, and carbonara. The menu also included, classic, arrabbiata (spicy), and the one I shall try next time (and I am counting the days till I go back) butter and anchovy. The golden breadcrumb coating remained crispy even when the supplì had cooled down a bit. It must be said though that they arrived at the perfect temperature to be eaten immediately, rather than the volcanic temperatures that supplì sometimes reach when they’ve been sitting under heat lamps all morning. The supplì. Each hiding their own individual interior. The flavours didn’t disappoint either. Again, because they were not scalding hot you could taste the ingredients fully, each supplì proclaiming its own individual character while pouring fresh umami into your mouth. I know, I know. But they really were that good! Although, as the name suggests, supplì are the main event, there are many other things on the menu. They represent the best of Roman cuisine even, in the case of polpette di alici con ‘il mio Garum’, (anchovy balls with my version of Garum) giving a nod to Ancient Roman cooking. Garum was a kind of anchovy sauce that the Ancient Romans used to season food, similar I imagine to modern Thai nam pla. We saw an stylish plate of black rice topped with smoked salmon being taken to someone’s seat. Delicious. We also managed to convince the charming frontman Fabrizio to spare some of his time for an interview. He explained that the idea for the shop was to build upon the recent renewed popularity of the supplì by offering a quality product distinct from the mass-produced or even frozen supplì you can find served elsewhere. 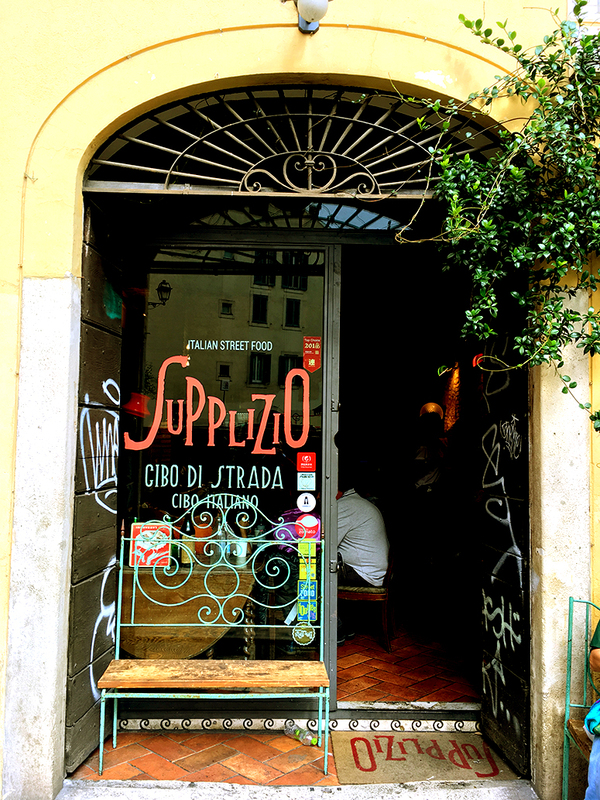 By taking supplì off the street where they were born and serving them in an inviting environment—we sat on a long leather sofa so comfortable I could have taken a nap on it—Supplizio is giving this grand classic of Roman cuisine the respect it deserves. But don’t expect to be overcharged for the privilege. The supplì go for €3 a pop, a price I’ve paid for mediocre supplì in the capital and more than worth it. You can see why I love this place. The cozy atmosphere also fosters a camaraderie among clients and we ended up happily chatting to the people around us. One guy, a regular and supplì afficionado informed me in hushed tones that Arcangelo Dandini’s carbonara is one of the three best in Rome. I can’t wait to visit his main restaurant, L’Arcangelo, so watch this space to hear how that goes. Supplizio, Via dei Banchi Vecchi, 143, 00186 Roma, Lazio, Italy. Open Monday–Saturday 11.30–16.00 and 16.30–22.00. Closed Sundays. So wish I would have known about this place in June! I’ve never had a really good supplì (sorry to say, but compared to how good the arancini were in Sicily), but looks like this is the place! Grazie! I’ve had plenty of good ones but some really bad ones too. This is the place though. I can’t wait to go back. How wonderful that you were able to meet a fellow blogger in the Eternal City. Looks like a wonderful day!